We have been feeling the neighborly love of rural living so much lately. 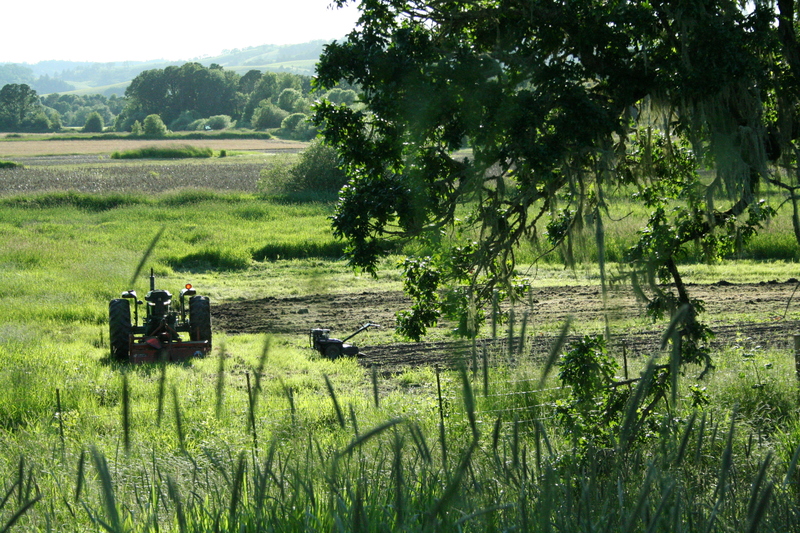 That tractor pictured above is in the middle of prepping our luscious bottom land soil–which is finally dry enough to work–for the upcoming planting of fall/winter crops. See that rototiller there? It is ever so much smaller than that tractor! And the farmer spends hours upon hours working ground with it. It has proven just right for working our sloped field now that we have been growing on it for a number of years. It takes just a few passes to work in the compost mulch that has been added, and with single row plantings, works fine for cultivating for weed control occasionally through the season. We have a furrow attachment to hill our potatoes and the farmer usually enjoys being mobile while he works rather than stationary. However, this small ditty is horrible for getting new spaces into production, and we have two areas we have been trying to prepare for planting now for a few years. One is in need of serious amendment, so that will be a long process anyway. The other area is a portion of our bottom land. The soil is wonderful, but it was planted in canary grass before we bought the place, and is wet from December until May or June. When it is dry, it needs to be ready as fast as possible so we can make the most use of it we can with such a limited amount of time for growing on it. The tiller never could get as much of it ready in time as we wanted. One of our neighbors had stopped by earlier this spring with some mole and gopher traps. He, and his faithful sidekick Luca, spent some time investigating the various mounds of dirt around the farm, and ultimately reduced the population of these artichoke plant eaters and new row of seedling destroyers quite a bit. During this time, he and the farmer spent a lot of time talking farming. Our neighbor is one of a handful of folks who farm most of the land on our little road. He farms grass seed and grains and grows them fairly conventionally. When we first moved out here, all these fields looked the same to us–not ideal. But as we began to become familiar with our surroundings, we soon noticed this father and son driving back and forth on our road many times a day, a sweet dog in the back of their truck. We would see them walking in their fields when other fields rarely, if ever, saw the farmer who was “farming” them. We appreciated that. After getting to know them, and subsequently many other farmers in our valley who grow crops in all manner of ways, it really became impossible not to separate our dislike for certain farming practices from the wonderful folks still out here engaged in working the land. And with our neighbors, this is doubly true. So while talking about farming in general and farming our land in particular, two wonderful things happened. First, this tractor came for a visit! Our neighbor offered to work up the area we needed ready in our lower field, so generous! And probably even more exciting was this: he offered to help Andre find some land to lease on our road! Although we love our little farm, our years of getting a business started on it have made us realize that although it makes a great homestead–what, with all this fencing! a turn of the century barn in solid condition to build a home out of! a giant machine shed and a workshop! and a lovely view!– it is not the ideal spot for growing vegetables for a living. Through the farmer’s eyes back when we were looking at properties, it looked like the perfect permaculture spot, and that it is! The water alone is worth it. But we need some good easy ground to grow vegetables on. As we mentioned above, our bottom land is great, and makes up about 7 acres of our property. But with such a short time available for growing on it, it can only be a small part of our growing space. The rest of our land is much better suited to fruit and perennials, and our own goats and pigs and chickens. 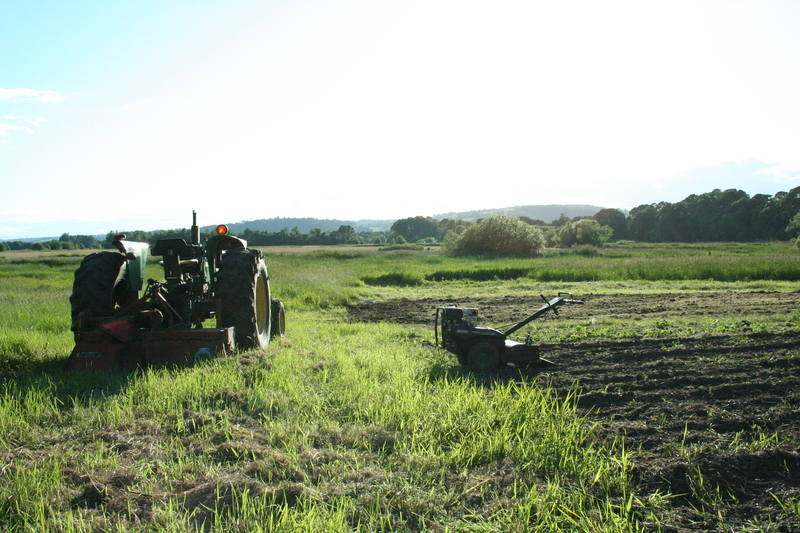 Starting last fall, we had the opportunity to begin working on an acre right outside of town. It has been nice to have the extra growing space, a warmer micro-climate, and somehow, no slugs over at that piece of land. We originally planned on just planting it in a few crops for the fall and winter. We weren’t sure about water, and we weren’t sure about needing to go so far to harvest on a weekly basis. In the end, we have collaborated with the owner on getting irrigation set up and decided to plant it more broadly. So far, it hasn’t proved to be too hard to get the work that needs to be done over there done in one long day plus a few evenings after our markets when the farmer is already in town. Getting the feel for this has just made our back burner plans to find some acreage to lease move to the front burner. Wednesday night, our neighbor showed the farmer a really nice 5 acres with water and good soil right near our home. It is too perfect– I hate to get too excited about it. But just this maybe helps us feel like we will find the spot we need to easily grow more great vegetables while growing great fruit and other perennials on our own, much more dynamic, piece of ground. Growing the business in the way that is right for our land’s particulars. And if things work out with that 5 acres, or another 2-4 somewhere else, we will likely just have to bite the bullet and finally get a tractor ourselves. Until then, it is nice to have so much kindness and generosity for neighbors. In his way, our neighbor is now part of another kind of farming. Even though we don’t understand each other’s perspectives entirely when it comes to this, working together comes naturally. It’s just neighborly love. What a lovely blog! It is truly wonderful when the spirit moves between people, bringing them together. I love how he reached out to help with the tractor. What a gift that was, I’m sure. May love and prosperity dance between you throughout the winds of time.